29 feet of Twisting Excitement! Description: Have the BEST DAY EVER with one of our newest, fastest, craziest slides yet! 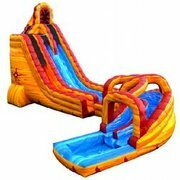 The Lava Twist starts with a race atop the giant slide, then speeds up and around an exciting twist that propells you into a refreshing SPLASH in the pool.